The Saranac Root Beer Review by Handy Father. In 1888, when our small brewery was founded, real rich, creamy root beers were not uncommon. Thirty years ago, we brought this tradition back with the introduction of real brewery-fresh root beer on draft in our berwery’s 1888 tavern. Our Saranac root beer has been acclaimed by consumers from all 50 states and over 100 countries. We hope you enjoy it too! Saranac Root Beer left the above directly on the neck of their amber colored bottle. We had some high hopes for an excellent, creamy root beer. Sadly though, the only indications of creamy were the thick very small bubbly head, and the smell. The taste, however, was not creamy at all, and lacked any standout flavor. There was a hint of an almost cherry flavor to this root beer, but was otherwise underwhelming. There was a fairly strong caramel/sugar flavor, but the HFCS was mostly to do with that. We gave the Saranac Root Beer Review a 3.0 out of 5 stars, as it wasn’t terrible, but lacked any stand-out flavor to set it above the competition. 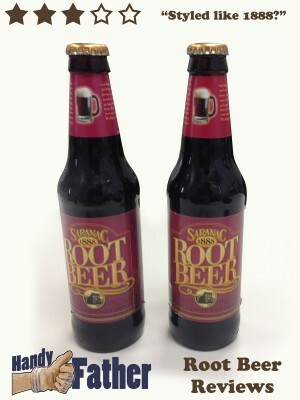 Saranac root beer ingredients: Filtered water, high fructose corn syrup, caramel color, sodium benzoate (preserves freshness), natural & artificial flavors, citric acid. If you want to formulate your own opinion of Saranac Root Beer , you can find it at this link! Once you’ve tried it, leave us a comment and let us know what you thought, or tweet @HandyFather. As always, you can view all of the Handy Father Root Beer Reviews here.